Clogcon! After Weeks of preparation i was finally there. The past months have seen me trying to split my time between wast amounts of work, and trying to figure out what to pair with Makeda. Which means that i haven't had much time to blog unfortunatelly. I went through a lot of different lists, even changing the layout of Makeda to try and find the best pair Skorne can bring to the table. So, which of our Warlocks can deal with the aforementioned casters? 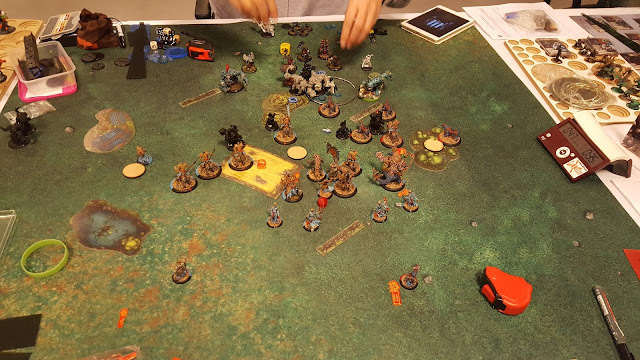 I tried a lot of different casters and list, and in the end, i was left with Hexxy2 and Mordikaar. My friend and fellow tyrant Johan from Sweden went with Hexxy, but i felt that i did not have the time to learn how to play him properly, so i went with Mordikaar with Void Spirits and Despoiler. A list that pretty much plays itself against many opponents. First game. Xavi with Trollbloods and a Kallandra/Grissel2 (I think?) Pairing. Without Madrak, i feel completelly safe dropping Makeda into Trollbloods. In return i got Kallandra. Let's go! So.. A lot of armour and hitting power. Not too much mobility though, which is really good for me as the Scenario is Incursion. Star-Crossed can be a real pain, and Befuddle can mess up Stay Death ranges. But i don't think he has the number of Quality attacks to break through the catwall. I win the roll off and decide to go first. He picks a side with two walls. 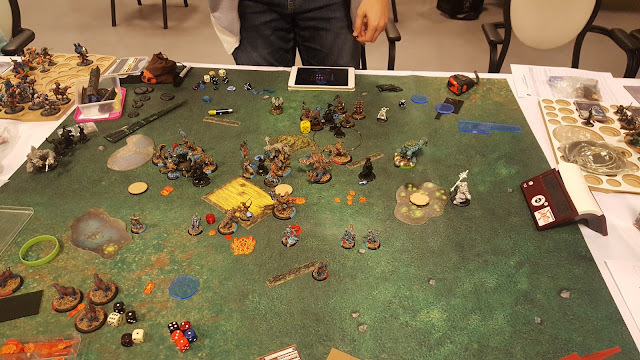 I deploy centrally, with the Void Spirit on the flank i suspect he will go for. The plan is simple enough. Get up the board and start the grind. On Incursion i believe the Atrition aproach is better ten trying for the Scenario straight away, but if i can find an opening, i'll use my speed to take it. He deploys behind a central hill, one unit of Fire eaters on each flank. I run everything up. Iwant to put the pressure on him early, so i let him get to a few Ferox with his Fire Eaters if he wants to, But the damage should be insignificant. Storm Rager goes up on Radheim. He walks everythin up, casts Star Crossed, and start spraying the Ferox. He hits with every single spray, and roll high enough on the damage rolls to knock four of them down to one box. and force me to Stay Death them. 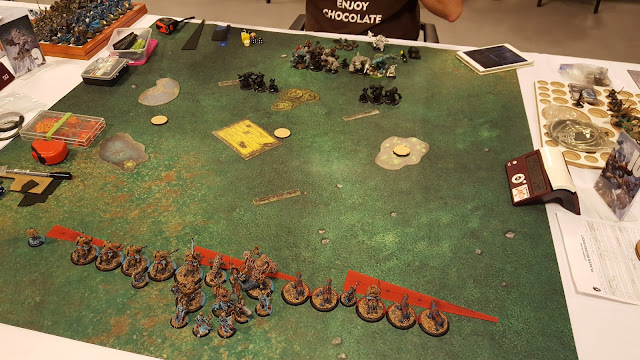 Void Spirit runs to the Left Flag, Ferox charge in to get boosted Attack rolls to avoid the worst effect of Star Crossed, while allowing me to save my Feat for later turns. I still roll miserably though and only manage to kill two of them, not even knocking down the remaining four.. Really not a great start.. I make sure to keep everything within Dodge and Stay Death and contest the central and Right flag. The remaining Ferox try to Jam his beasts. Hopefully making sure he can't get a ton of work done. This ofcourse fails as his dice are still red hot. Not a single miss, and high Damage rolls sees me burn through my Fury in no time at all. when all is said and done, and Hutchuk has entered play, i'm five cats down. He runs the Mauler over to contest the left flag. I figure i can let him have the right flag if that means i can get the centre and left under control. Unfortunatelly, while his dice are glowing, mine still seems to be tired from the trip to Amsterdam. 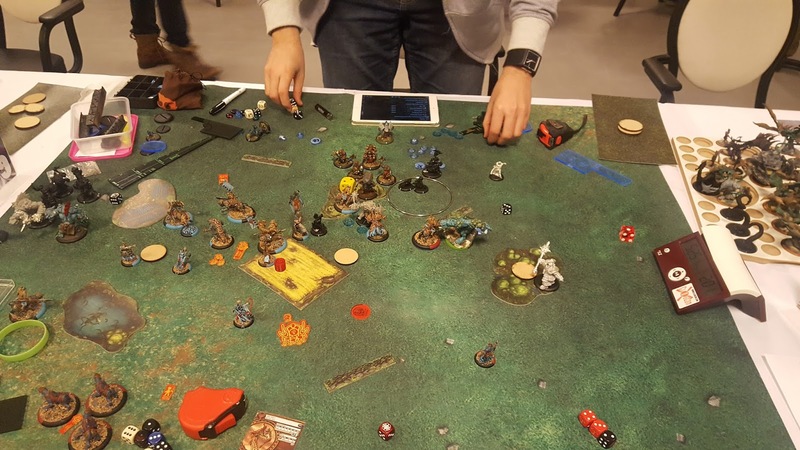 I still can't kill Fire Eaters, (Only killing one with Radheim after he finish of Rôk after Despoiler fails to kill him), and the Mauler is left with one box in each aspect. I even Feat, but to no avail. I fail to clear any of the flags, and now the right flag is open for the taking. His dice finally fails him a bit, and even with feat, he fails to do any real damage. 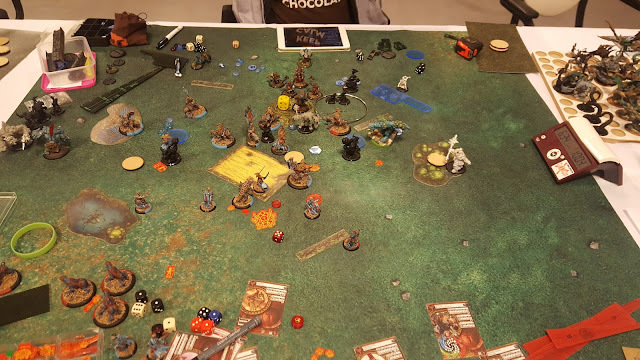 Despoiler goes down to the combined effort of Earthborn, Bouncer and Fire Eaters, but on the other flankhe miss every single to hit roll with his Mauler, which was completelly boxed in by Ferox, so i get to dodge away. And Tough Rolls starts happening as well. 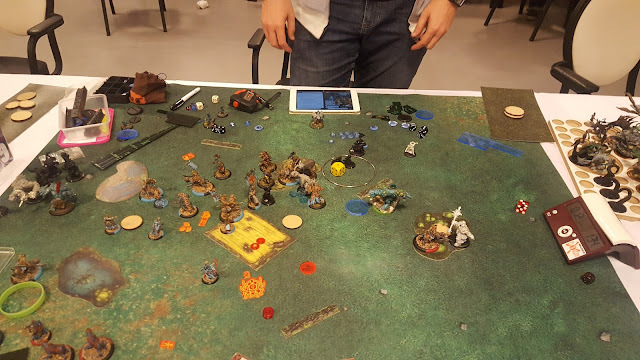 Hutchuk moves in to score and kills a couple of handlers with a grenade. Fire eaters still refuse to die, and i have to use way too much effort to kill the mauler. 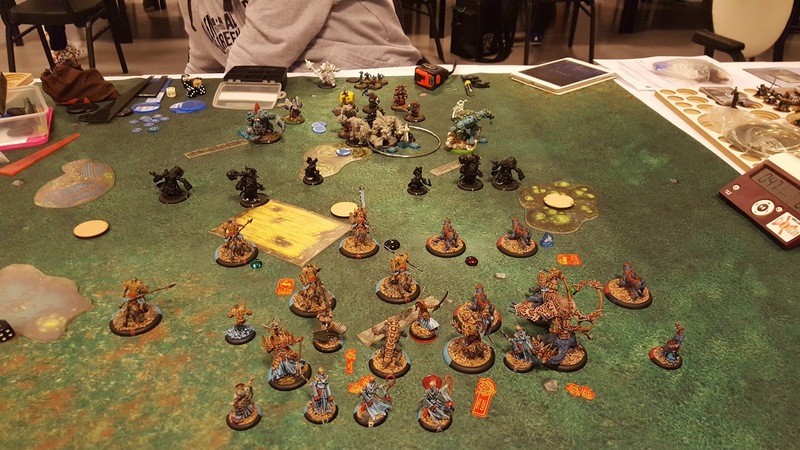 Willbreakers move in to score and contest. Tycom deals a bit of damage to the bouncer, and i jam the earthborn. While he have much more success, killing me than i have killing him, he's starting to get dangerously low on the clock. He have no way to contest my left flag, so instead he tries to clear the centre. Stay death means the damage is non significant. 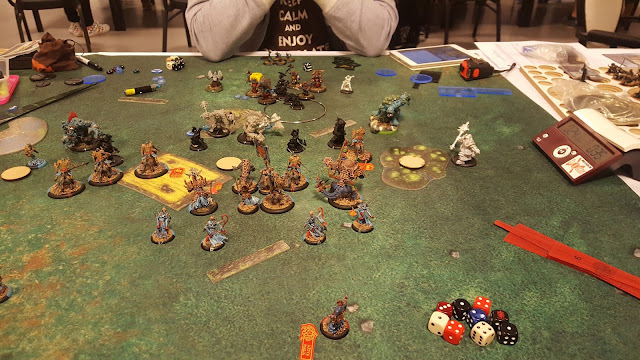 Hutchuk kills the contesting willbreaker, but when the earthborn fails to hit the jamming Ferox i dodge over to contest. After this i don't have the time to take any more photos, but what happens is i move to 2-1 in his turn. In my turn i clear the centre and Radheim moves to the flag to score. Moving me to 4-1. Makeda pulls back so that it's impossible to assassinate her and i block his access to the left flag. It's now impossible for him to contest me in his turn and that's all she wrote. Whew! that was a close one. 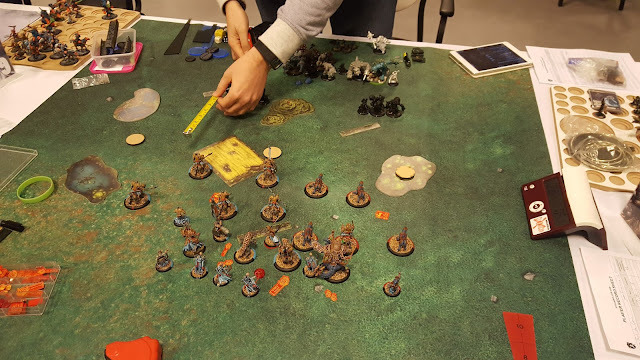 After my dice failed me and he got so much work done T2, i thought i would be done for, but i once again prove how strong this list gets late game, attritionwise. Stay Death get's exponentially more powerfull as the game progresses and there's fewer and fewer models that can deal damage. and in the end i manage to grind him out. A great game, a great opponent, and a great start to the tournement!